MINSK, Belarus — Alexandra Chichikova has been in a wheelchair since she broke her back in an accident at the age of 17 — but she doesn’t think her disability should keep her from becoming a mother someday. 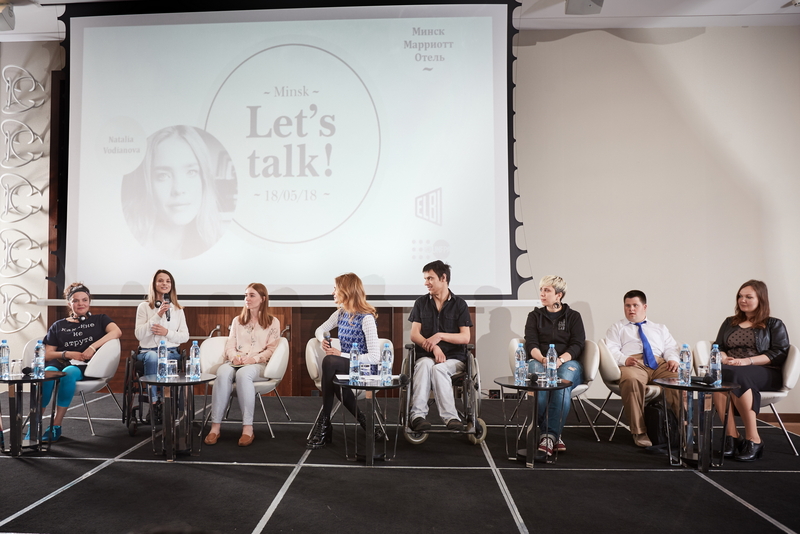 “I can have children, but it will be challenging,” Chichikova, now 25, said at a panel discussion last week on stigma and taboos related to the health of women, young people and people with disabilities. “Health clinics and gynaecologists are often not accessible for people in wheelchairs,” Chichikova explained, adding that many women like her also face negative attitudes from health care providers, suggesting that they shouldn’t have children because of their disability even if they could become pregnant. The panel discussion, organized by UNFPA and the digital fundraising platform Elbi and moderated by Russian supermodel-philanthropist Natalia Vodianova, served to highlight the real-life experiences of people facing stigma in society, and to chart ways forward for combatting stigma and breaking down harmful taboos, especially in the field of sexual and reproductive health. The audience heard a variety of stories from people living with disabilities, the manager of a shelter for survivors of domestic violence, an HIV activist and a youth peer educator. Representatives of private sector companies, NGOs and service providers also took the floor to describe how they are involved in addressing the issue. The event was part of a partnership between UNFPA and philanthropist Vodianova centered around her #LetsTalkAboutIt campaign to tackle taboos around women’s health issues around the world. For Alexandra Chichikova, the stigma associated with disability has had dramatic consequences for her personal life. “With one exception, all my friends vanished after my accident,” she said at the Minsk event. This experience contributed to her decision to become an activist to fight stigma and raise awareness of the needs of people with disabilities. She was crowned the first Miss Wheelchair World in the competition held in Poland in 2017, is an actor in a play dramatizing society’s attitudes towards people with disabilities, and does human-rights work in this field.